Agrabah—In preparation of his first big boy fieldtrip to the Middle East, President Trump directed his staffers “to find a way to keep me motivated and comfortable in Agrabah and Ishtar, and all the rest of the weird scary places they’re sending me next week.” The staffers thought to themselves, what does Trump really need for this trip, besides his ‘woobie’? The answer was obvious, endless mindless adulation (EMA). Team Trump then contracted with the owners of Kidz Bop to create a supportive Trump-friendly rally compilation. 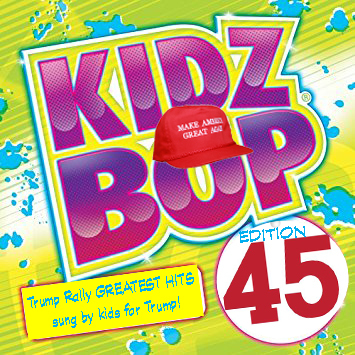 Not only did Kidz Bop take the job, they were convinced a series of editions could help the president through any number of the challenges ahead, not the least of which being his pending impeachment proceedings. They are even making an edition for Press Secretary Sean Spicer, complete with Buddhist chants covers, tantric relaxation ditties, and all the songs are interlaced with the sound his dog makes when he goes home and kicks it.